We again have in stock precision cut vertical drive pinions and camshaft gears for all models. These can also be fitted to the pre war overhead camshaft Morris Minor when using the later taper fit drive fork. 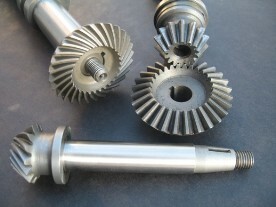 We are only stocking spiral cut gear profiles as straight cut gears are generally unpopular due to their noisy running. In addition, this time we are only stocking the 'tapered' pinions as these make for a better standard of engine rebuild compared to the earlier parallel fork type fitting. When ordering, please specify model as M/C/D/J & OHC Morris Minors use a 0.5 inch dia camshaft drive bore compared to the 0.625 inch dia bore for the P/L/N/Q/R and K types.